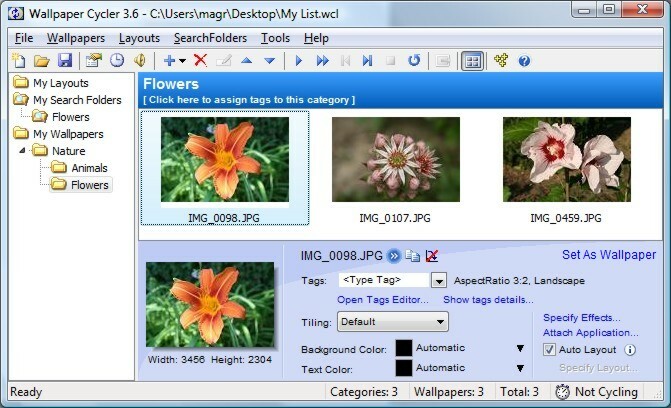 Wallpaper Cycler Lite is the free lite version of Wallpaper Cycler which is an easy to use, yet powerful desktop wallpaper manager/changer to get rid of that boring static wallpaper on your desktop. You can change the wallpaper with a specific delay or at specific times. Wallpapers are easily managed in multi-level categories which can have time constraints. For example: a category can be defined for wallpapers that will only be used in the summer. Categories can be linked to folders on your hard disk to automatically detect new wallpapers. A lot of attention has been given to the performance of Wallpaper Cycler. As a result, Wallpaper Cycler allows you to manage tens of thousands of wallpapers without slowing down. An advanced random selection algorithm is included to ensure that all wallpapers are randomly chosen before a wallpaper appears again. Wallpaper Cycler can also monitor your CPU load when it wants to cycle and prevent cycling when your CPU is too busy, has several types of tiling modes, can automatically calculate a suitable desktop background color, can make the icons transparent on your desktop or hide them completely, supports system wide hotkeys, has shell integration and much much more. Wallpaper Cycler has three types of wallpapers: image, gradient and URL. URL wallpapers allow you to add webcams to your desktop. A lot of image formats are supported, such as JPG, JPE, BMP, DIB, RLE, TIF, PNG, TGA, ICB, VDA, VST, JP2 (JPEG2000), JPC, PCX, DCX, PNM, PGM, PBM, PPM, RAS, ICO, ANI, EMF, WMF and GIF.